Our gluten free mixes mean that anyone can rustle up a sumptuous and delicious gluten free sponge cake. 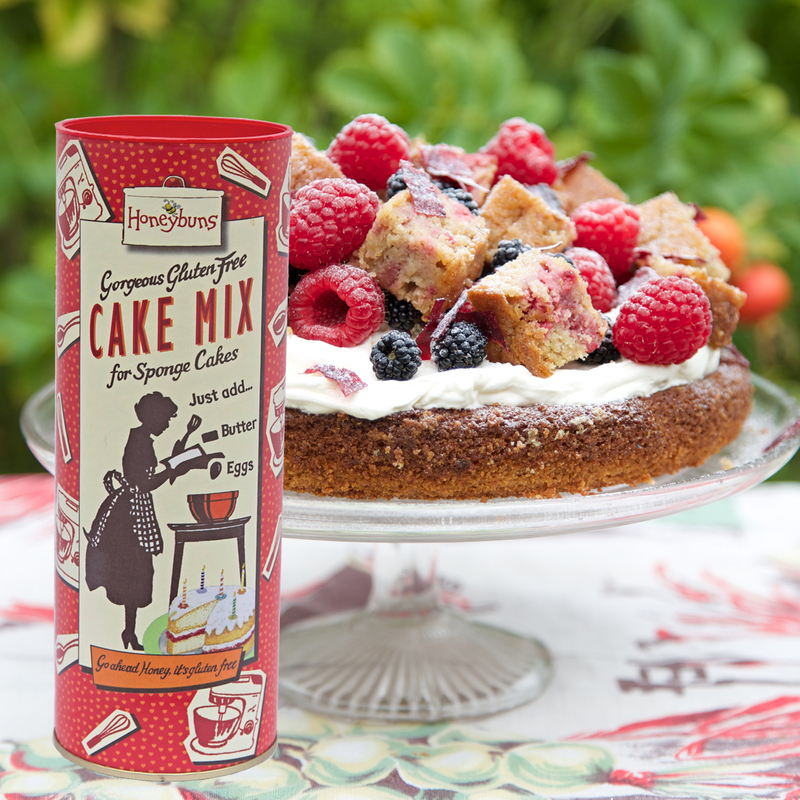 The Honeybuns Gluten Free Cake Mix is fabulously easy to make, just add eggs and butter. Using luxurious natural gluten free ingredients, the mix is delicious baked naked but it is extremely versatile and can be adapted to use seasonal ingredients. Comes in a beautifully designed retro-inspired reusable cardboard tube. Ingredients are wrapped in cellophane with easy to follow instructions. Includes an insert sheet with more recipe ideas (download a copy here). Refill packs are available. Make an excellent store cupboard treats and the sweetest of gifts. For help and other info see our Home Baking Mixes FAQ. Take a look here at some of the delicious Cake Mix recipes we have featured on Em's Blog, including this delicious gluten free Chocolate cake, Deluxe Trifle, Christmas cake and Mini Carrot Loaf Cakes. The Cake Mix is a Gold Great Taste Award winner. "Lovely, light moist texture. Rich in vanilla and the syrupy sugars come through well," Great Taste Judges. "Lovely, light moist texture. Rich in vanilla and the syrupy sugars come through well," Great Taste 2014 judges. "Felt like a treat and tasted and felt like a real sponge - would definitely use again," L.T. "Found your cake mix! Love it! !," S. C-B.